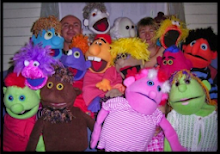 Hi all, My 10 indigenous puppets arrived safely at their destination and I'm told they will be given out to different schools in Victoria as a way of communicating and opening up young people to talk about the issues they face today. What a great way to use a puppet! its been great to be a part of this project. 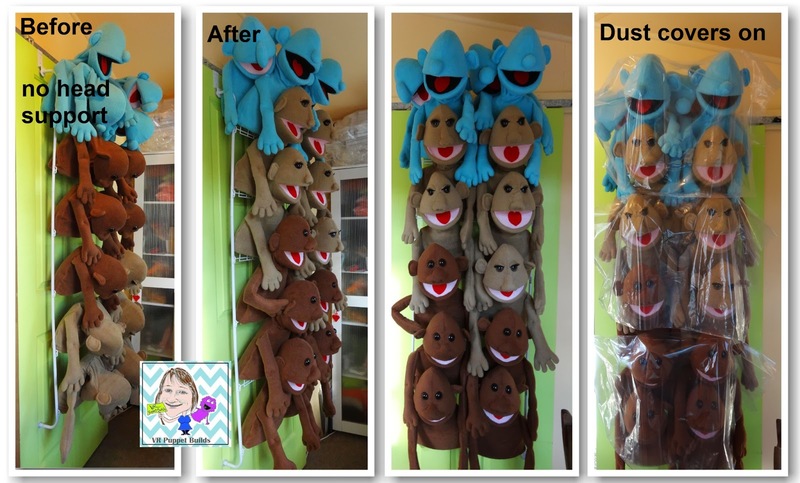 Well in today's post I wanted to share with you my puppet storage solution. I searched everywhere on the net for something that would suit my needs and if your familiar with my crafting area you'll know how small it is!!! The only available area I had left was on the back of the door! 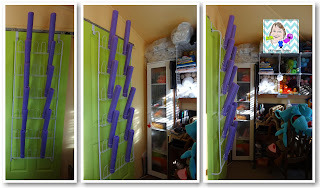 which got me searching out "over the door" storage racks which led me to this Whitmor over the door shoe rack. It was pricey to buy here in Australia but I did see them over half the price cheaper in the USA but they wouldn't post them to my area. So I took the plunge and bought one and I'm pretty happy with how it has worked for me. I did have to do some minimal changes to this rack to support the puppets heads using pool noodles and some cable ties but that was pretty cheap and easy to do myself. 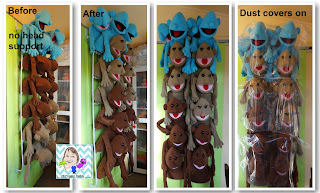 It fits 12 regular size puppets on the whole rack, 2 on each row but if your puppet bodies are smaller you could adjust that to fit a few more..... So after using this for the past few months now the only down side was.... the pool noodles do bend a little with the weight of the puppet but that was easy to fix just flip the noodle around. and I did find when I finished all the hair and dressing the puppets the rack weight wise was definitely maxed out! so after posting away the 10 indigenous puppets I now have another four on the storage rack waiting for me to put their features on and dress them. Overall I'm pretty happy with this storage solution! If you have any questions just email me and I'm happy to answer any questions you may have. I hope this may give you some needed inspiration or help in some way, now check out my video.... Happy puppeting! You have Awesome ideas!!! Great inspiration :) I'll definitely be referring people to your site, keep it up!